Joe was born on June 28, 1975 in Shreveport, LA. Shortly after, his family moved to New Jersey where he lived for 30 years before moving out to Liberty, MO in 2005 where he currently resides. He is single and has no children. Joe graduated from the County College of Morris with an Associate in Arts degree in 2002 and has also received career diplomas in Motorcycle Repair and Small Engine Repair since. He currently works at Ferrellgas, LP where he is a Facility Maintenance Specialist. Joe became of Master Mason in March of 2011. Joe is currently serving the Supreme Forest as the District Deputy Supreme Tall Cedar for District #17, which covers all of Missouri. He belongs to Harry S Truman Forest #212 in Kansas City, MO where he is the current Grand Tall Cedar. Joe is the current Junior Warden at Rising Sun Lodge #13 and a member of Liberty Lodge #31. He is also the Associate Patron of Barry Chapter #369, Order of the Eastern Star, Treasurer of Liberty Chapter #3, Council #50, Commandery #6 York Rite Bodies. and member of Charlemagne Council #79, Knight Masons, and Harry S Truman York Rite College #167. 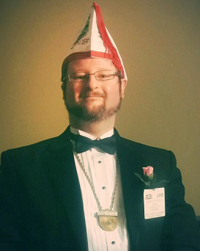 He is very passionate about freemasonry and its three tenets “Brotherly love, Relief, and Truth” and is a proud donor and member of the Lewis and Clark Society in the Truman Club and a Denslow Society member both in Missouri. Joe also donates his time to an area youth soccer program and is the current Regional Treasurer for AYSO Region 1161 in Kansas City, MO. In 2013, he was recognized by the Masonic Home of Missouri as the 2012-2013 Masonic Home Representative of the Year.